This story follows 12-year-old Miranda through a unique and interesting tale about time travel and how every moment in time is connected. Miranda’s story is a narration about everything in great detail that has happened the past fall and winter. The letter, aka the story she is telling, is the strange request of a mysterious individual who has left her notes and seemingly can predict the future. This person tells Miranda in the notes that he is coming to save a person she cares about and himself, but to find out if this person succeeds, you must read this book! I really enjoyed this book because of how you know nothing about the character, exposition, or setting, but slowly find out as you go on. There are also interesting descriptions of how each moment in time exists at once that makes you think in a whole new way. I would recommend this book to anyone who loves A Wrinkle in Time because it’s similar in its ideas of time travel and doing anything for those you love. 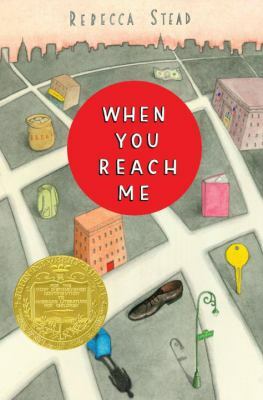 When You Reach Me by Rebecca Stead is available for checkoout from the Mission Viejo Library. This entry was posted in Book Reviews and tagged game show, secret messages, space and time by kotlcbooklover. Bookmark the permalink. I loved reading this book! It’s interesting to re-read the beginning after reading the end because you realize who Miranda is talking to and what she is talking about. Nice review! I really enjoy the things you write. This aroused my interest in reading When You Reach Me. I am going to borrow it in Mission Viejo Library!